Your inner glow is like soft, amber light. Seeping under the door. Gently filling the room with its presence. Tender, undulating light. It is light in more ways than one. I think of those photos I’ve seen of Tuscany, the warm sunlight, entwining its fingers through the vineyards, reaching out to protect and support. The inner glow of light you see radiating upwards on a warm, peaceful day. The glow is also the light you see in the eyes of your dear ones. They sit across the table and you notice the tiny inner glow in their pupils, this minuscule and miraculous spark of light and life directed right at you. Soft, gentle, forgiving light. Imperfect, beautiful light that comes from the inner glow of imperfect, beautiful people. Relaxed, limbs loose, flowing. Conversation flows in this light too, words connected, moving across your lips on this gentle stream of light that has suffused the room you’re in. It persists, inside, outside, everywhere. 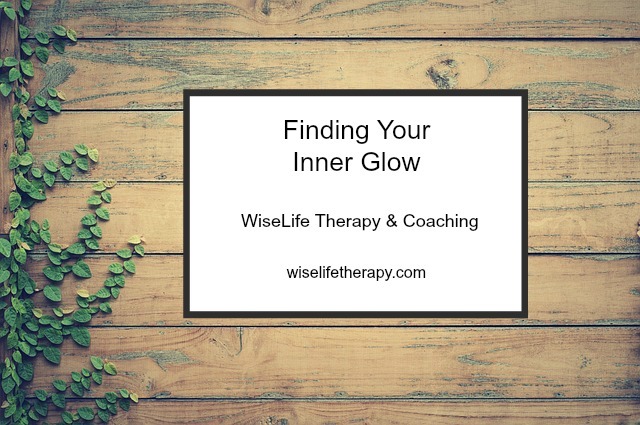 The inner glow attaches itself to you and you carry it with you, sometimes without even knowing it. Your inner glow gifts itself to you when you’re ready to open to it. It’s not that the inner glow withholds itself purposely. Not at all, that’s not its character. But it is wise, it knows that it may take you a lifetime to be able to open to it. To see it within yourself. And that’s okay. So it waits. The inner glow waits because it knows that at some point the day will come when something shifts. It waits patiently for you to consider that the hold the harshness has on you is not a lifelong trap. And on that day, in the midst of the harsh glaring light of day-to-day life, the light you must shield your eyes from, the light you sometimes enter the moment you awaken and stay in until the moment you close your eyes to sleep, something turns. Yes, the day will come in the center of all the pushing and pulling and obliterating light, when you will momentarily see past it, see through it towards another light, this gentle inner glow. Where life has a different quality. And perhaps even love has a different quality. No matter how long it takes, the inner glow is always waiting for you. Reaching arms of light through the harshness, warming you, opening a crack, finding its way through. And truly, in those moments (because there will probably be many), you are glimpsing all the missing pieces of you that aren’t really missing at all. Instead, they’re waiting to come forward, to take up some space at the table of your life, to be nourished and cherished. So maybe it doesn’t much matter if you persist in giving words to the harshness. Maybe you don’t need to claim it so vociferously, or write down everything you know about it. Because you already know. You know what it feels like to be in the harsh, hard light. You’re probably an expert on the struggle, the overwhelm, the day-to-day onslaught. You’re quite familiar with the difficulty of saying “no” or “later,” and taking time for the other parts of you. Yes, you know, and you’re not required to write a treatise on it. Perhaps you don’t even need to excavate for it any longer. You might notice the harsh, hard light in dozens of past, present and future experiences. So, there it is, you say, matter of factly. You’re wise enough to know it can arise in any moment. It might be familiar (“Oh, this again”). Or unexpected, a new thing or task or thought that feels harsh. But, you already know this. You already know so much. So no need to explain or re-explain it to yourself. Instead, look for the cracks in the harsh light. Locate those first rays of soft, gentle, amber light. There are two kinds of light–the glow that illuminates, and the glare that obscures.